Your dog may be housebroken but are you aware of where your pooch is marking his territory outside? Hopefully it’s not on your air conditioning condenser! Did you know dog urine can corrode and rust the fins on your air conditioning condenser? The fins are the thin pieces of metal that defuse heat. 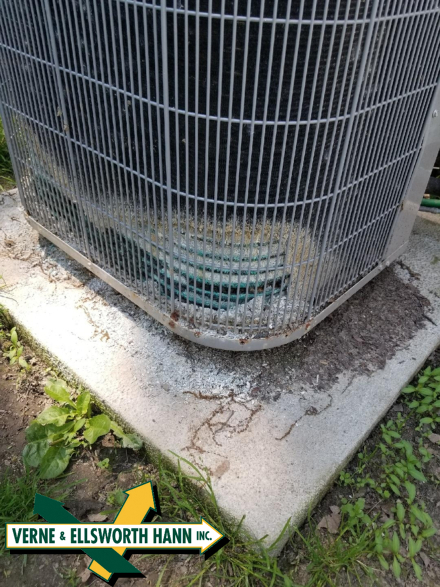 Over time, dog urine can eat right through the fins and cause the coils inside to rust which can lead to a refrigerant leak. In most cases, a refrigerant leak means your air conditioning system would need to be replaced. Verne & Ellsworth Hann recommends all dog owners prevent their furry friends from urinating on their air conditioning condensers. the consequences can be very costly.